Evan Yares tells us why he thinks 3D modeling is so difficult. OpenLB, the open source Lattice Boltzmann code, has been updated to version 0.8. Tridiagonal Solutions has entered into a partnership for the simulation of combustion in the cement industry. This is a screen capture from a video of a CFD solution of a spinning F-1 car. Video by Sauber F1 Team. Click image for video. Having just seen Prof. Hertzberg present her work at the APS/DFD meeting, I recommend that interested students take her course on Flow Visualization: The Physics and Art of Fluid Flow. There’s a job opening for a CFD Analyst/Engineer in the UK. 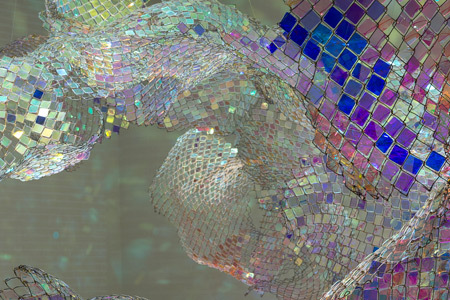 Earlier this year, sculptor Soo Sunny Park’s Unwoven Light was exhibited at the Rice Gallery. Made from chain link fence and plexiglass, the work intends to make light visible – but not stagnant. If you don’t believe me, watch the brief video in which one of Rice’s physicists talks about the piece. Of course, I just see a quad mesh with an undefinable metric displayed for each cell. I think the artist sees that a little bit too based on the name – “unwoven” implies an underlying mesh. This entry was posted in Applications, News, Software and tagged jobs, OpenLB, visualization. Bookmark the permalink.